Private club villa “Captain”, which is situated at Arabatskaya strelka (Gengorka, Ukraine) in 300 meters from the Azovskoe Seaside and 50 meters from the unique salt lake Sivash have its own specific atmosphere, that inclines for relaxing and become more healthier! Elite, fancy, comfortable and secluded territory. Groomed greening terrace, the fountain, branches, a summerhouse with the barbeque and Russian famous oven, connected between each other balconies with the picturesque view on the sea, charming sounds of the sea waves. It is a perfect place to become healthier and to gain straight for upcoming year! Vacation in the villa “Captain” will be wonderful and unforgettable! Villa it is not a huge complex, so it can accept only limited amount of visitors. It was created for fancy people who used to the comfortable travelling! Our service will take care of you and you will feel safe and somebody very important, because we love our clients! 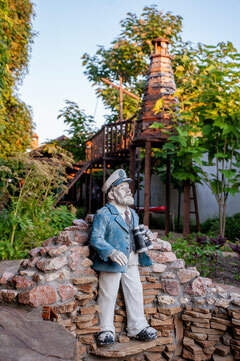 Design of the villa is in pirate’s style with the sea-style elements, which was created by the owners of “Capitan”. All rooms in the villa have their different names and styles. Villa proposes 1bedroom and 2bedrooms rooms with everything for your comfort ( conditioning, TV, DVD, hot and cold water are avaible 24hrs a day), free Wi- Fi . Yours to command our tavern with very tasty home-made meal and a bar. We have summer house with 6 meters wooden table and complex with a barbeque and Russian oven for preparing a fresh-soup and pilaf, smokehouse. Grill menu is cooking in front of your eyes, so you can also participate in this process if you will wish, of course. It’s a perfect place for birthday parties, corporative parties, friends meetings or other events. Our stuff also provides thematic parties. You can be informed about the date and the time of our parties from the social network’s pages. “Captian” also can organize a private party just for you! Because the peaceful and quiet atmosphere you will feel yourself like at home, enjoying sound of the Azov sea you will easily forget about all your problems and you will refill your body only with positive energy! Natural and climatic wealth of Arobatskaya Strelka is just incredible! Villa “Captain” is just in the most favorable part of it – from one side is the salt lake Sivash which is so famous by its therapeutics properties, and from other side situated masterpiece Azov seaside, in 7 minute walk from the villa. You can also enjoy the view of the lighthouse from the Beryuchij island just from your balcony. You can order some extra sightseeing tour such as boat trip, visiting Askania Nova national park, looking on the process of salt manufacture or others. Not so far from the villa (about 3km) there is a hydropath and a hot source. Over there you can have the course of treatment for your nervous system, for skin illness, for musculoskeletal system, endocrine and vascular pathologies. There are also open 2 sources of chloride-sodium and iodine-bromine water with high mineralization. Villa “Captain” is always high quality of living and high level of service as well! Vacation at “Captain” on Azov Sea it’s the best way to refill your energy and health, enjoying unique properties of the Sivash Lake’s waters. Captains! Turn on the motors, set the sails and hurry up to private club villa “Captain” on the Arabatskaya strelka seaside ! Everybody to the board of our boat!! !